A water colour of an unusual subject matter by the artist Claude Buckle. 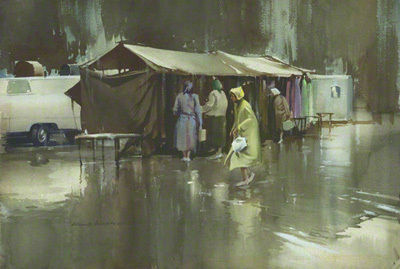 The picture depicts Salisbury Market Place on a very wet day. The figures shown are of women shopping, a typical scene that is repeated every week up and down the country. The lady in the foreground is modelled on the artist's wife Barbara. The painting was made one to two years before the artist's death. Created in 1972. 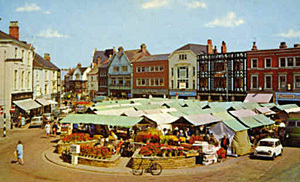 This is a photograph of Salisbury market place taken around 1970. The stands appear to be similar to that of the Claude Buckle painting.